which is responsible for data processing operations handled in SfDataGrid. Syncfusion.SfGrid.WPF Syncfusion.SfGrid.WPF assembly contains classes that handles all UI operations of SfDataGrid. 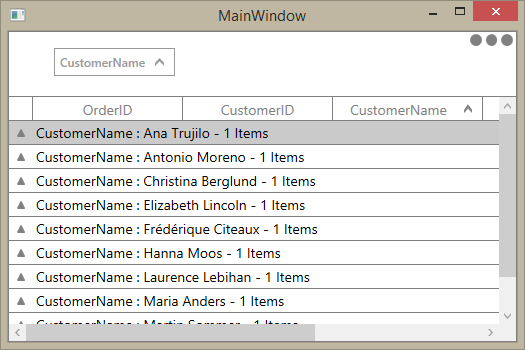 SfDataGrid control present Syncfusion.UI.Xaml.Grid namespace. This namespace also added in http://schemas.syncfusion.com/wpf Syncfusion WPF schema. Syncfusion.Shared.WPF Syncfusion.Shared.WPF contains various editor controls (such as IntegerTextBox, DoubleTextBox and etc) which are used in SfDataGrid. Syncfusion.SfGridConverter.WPF Syncfusion.SfGridConverter.WPF contains static extension classes for exporting SfDataGrid to excel and PDF in Syncfusion.UI.Xaml.Grid.Converter namespace. Syncfusion.XlsIO.Base Syncfusion.XlsIO.Base contains fundamental and base classes for creating and manipulating excel files. Syncfusion.Pdf.Base Syncfusion.Pdf.Base contains fundamental and base classes for creating PDF. 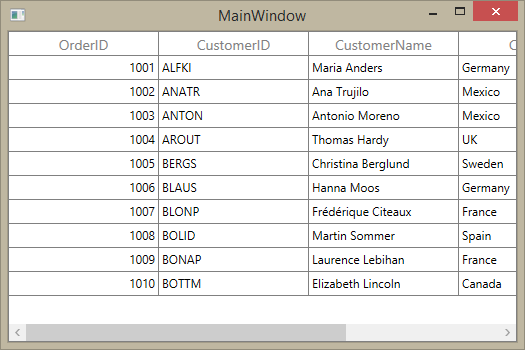 Create new WPF Project in Visual Studio to display SfDataGrid with data objects. 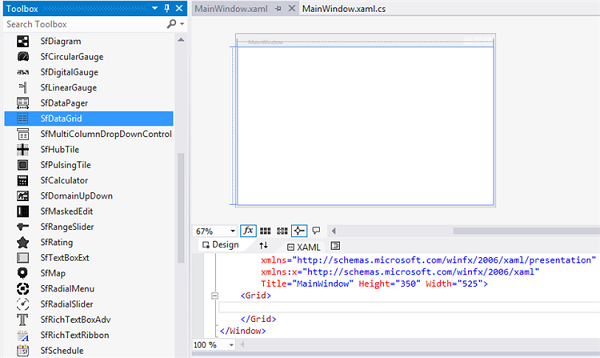 Import Syncfusion WPF schema http://schemas.syncfusion.com/wpf or SfDataGrid control namespace Syncfusion.UI.Xaml.Grid in XAML page. 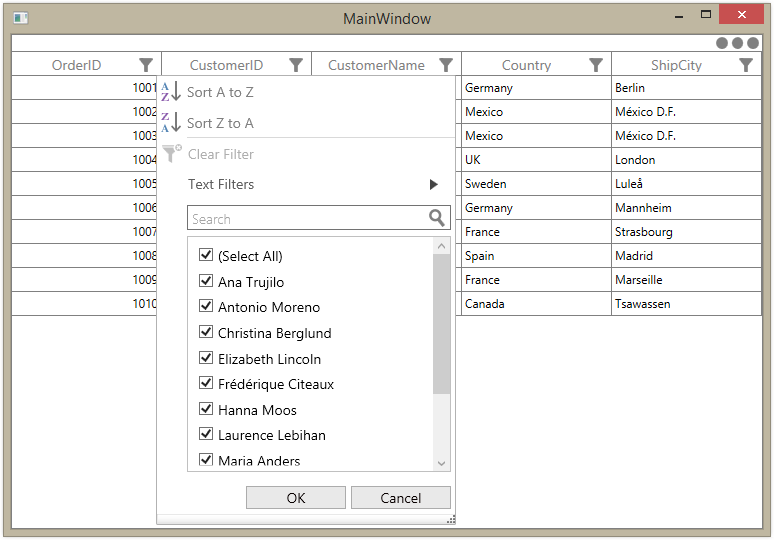 Import SfDataGrid namespace Syncfusion.UI.Xaml.Grid . GridNumericColumn Property of type Int or Double. GridCurrencyColumn Property with Currency DataType attribute. GridMaskColumn Property with PhoneNumber DataType attribute. GridDateTimeColumn Property of type DateTime. controls in its cells which is used to display numeric values with currency format. controls in its cells which is used to display numeric values with percent format. GridMaskColumn Represents SfDataGrid column that hosts MaskedTextBox controls in its cells which is used to display textual content by applying Mask. controls in its cells which is used to display format and display TimeSpan values. GridHyperlinkColumn Represents SfDataGrid column that hosts Hyperlink controls in its cells. Filtering can be enabled by setting SfDataGrid.AllowFiltering property to true , where you can open advanced filter UI by clicking the Filter icon in column header and filter the SfDataGrid. You can customize the filtering operations by handling SfDataGrid.FilterChanging and SfDataGrid.FilterChanged events. Editing can be enabled by setting SfDataGrid.AllowEditing property to true . Set SfDataGrid.AllowDeleting property to specify whether user can delete rows by pressing Delete key.